In a shocking incident, a 10-month-old girl was allegedly beaten up and kicked at a creche in Navi Mumbai by a caretaker, who along with the day care centre owner was arrested, police said on Friday. Taking cognisance of the matter after a video of the incident went viral, Maharashtra Women and Child Development Minister Pankaja Munde said the government has decided to make installation of CCTVs compulsory at such centres. Meanwhile, Navi Mumbai Police Commissioner Hemant Nagrale issued a set of instructions, making it mandatory for the creche operators, to get the police verification of their staff done within the next 90 days, among other things. 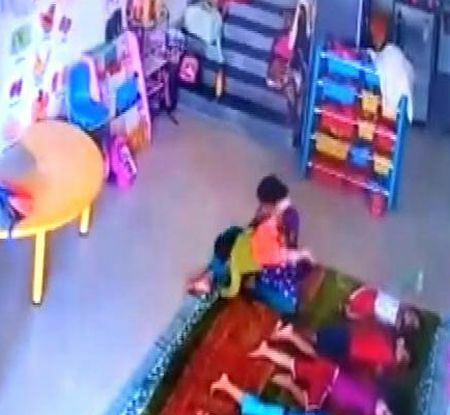 The incident came to light when the CCTV footage of Purva Play School and Creche, a day care centre for children at Kharghar in Navi Mumbai, was analysed by the police and the infant’s parents. Subsequently, Kharghar Police on Thursday arrested Afsana Sheikh and the day care centre’s owner Priyanka Nikam, 34. However, Nikam was later released on surety bail, while Sheikh has been remanded in police custody. The girl’s parents Ruchita and Rajat Sinha, who are complainants in the case, used to leave their child at the day care centre as they both are working. On Tuesday, when they went to take her, they found a wound on their daughter’s forehead. Ruchita asked creche owner Nikam about it, but she did not get a proper response from the day care centre. When the baby’s parents approached a doctor, he suspected it to be a case of child abuse. Subsequently, the child’s parents went to Kharghar Police Station and lodged a complaint. The police and the child’s parents were shocked when they later saw the CCTV footage of creche, which showed Sheikh beating and slapping children who were left by their parents at the day care centre. The CCTV footage also showed Sheikh beating Ruchita’s daughter while some other infants were sleeping, police said. In the video, Sheikh is seen hitting, throwing and kicking the child. Police registered an offence against Sheikh and Nikam under section 325 (voluntarily causing grievous hurt) of IPC and section 34 of Juvenile Justice (Care and Protection of Children) Act-2000, police official said. Munde termed the incident as shocking. “We have decided to make it compulsory to install CCTVs at play schools, to avoid recurrence of such incidents,” she said. Meanwhile, activists of Peasants and Workers Party held a protest outside the play school. The activists damaged the hoarding and posters of the play school, police said. Shiv Sena workers also staged a protest outside the play school and ransacked it. Navi Mumbai Police Commissioner, Nagrale, issued the set of instructions for the creches, play schools etc, stating that if these establishments do not follow the orders, strict action would be taken against them. “CCTVs should be installed in all such centres and the recording of the same should be backed up periodically. The management should check the recordings,” the order said. “The CCTVs should be linked to the computer system or the mobile phones of the parents of the children by providing them the user ID,” it said. “The creches/play schools should get the police verification of their current staff done within the next 90 days,” it said.